As part of a RTW, I will be travelling AMS-MAD-BCN in D on IB. Arrival is 2.40pm at MAD with connecting flight departing at 4.00pm. As I understand it, it is a T4 to T4 connection. I will be on an Australian passport. Is there passport control prior to making the connection? Will baggage be automatically transferred to the connecting flight or does it need to be collected and re-submitted? I suppose in summary I am asking if the time between connection is sufficient. Many thanks for any help proffered. The train connecting the T-4S satellite to T-4 must be accessed via lifts or stairs; the lifts are faster. A non-Schengen to Schengen connection can take an hour or longer - I'd leave 1.5 hours as minimum connect times, and possibly more for Schengen to non-Schengen if during busy hours due to security procedures. Connections to other terminals are by shuttle bus, and can take rather longer than one might think. If one wishes to connect to the Metro, one must also take the bus to T2 and proceed below ground level (well signed.) The Metro stop for T-4 is under construction and is to be open some time in 2009. T4S->T4S transit visa needed ? I can see you're a specialist. My friend is Peruvian and we'd like to go to Morroco with Iberia, connecting in Madrid T4S. Her flight from Lima arrives in T4S, and her next connecting flight to Morroco also leaves from T4S. So the situation is coming from non Schengen, going to non Schengen. Iberia tells us that she doesn't need an Airport Transit Visa.. but at the same time they say "you never know.. maybe immigration check might deny the transit". Since it's the same terminal T4S, it would be logical that there is no immigration check. That's what i'd like to know.. is there or not ? I remember very well arriving twice in T4S, but connecting to T4 to go back to France, and there of course i had to go through immigration. Unlike Iberia, the Spanish embassy tells us of course that she DOES NEED the transit visa. And then they take every silly argument to refuse it (but that's another story). So we'd like to know.. could we trust the words of Iberia, and proceed with our tour, or do we risk a control and a refusal, and our entire tour collapses ? Is there also the risk that Iberia suddenly changes the terminal of arrival/departure, and that she finally HAS to change terminal, and then go through immigration check ? As long as she remains within the T4S, she will not have crossed the Spanish border, neither will she have to go through any kind of passport control. The overpaid embassy staffers are, as usual, talking bollox. Hmm, my doubt exactly as alex_photo's, I checked my itinerary again today from Chile to the UK, (SCL-MAD-LHR), I do arrive at T4S in Madrid, and then I have to connect to T4 for my connection flight to London. I only have 1hr 50mins. for this. Will I have to go through Passport Control? - I want to be prepared with all my papers in hand, and cash and all that... *worried*! Hmm, my doubt exactly as alex_photo's, I checked my itinerary again today from Chile to the UK, (SCL-MAD-LHR), I do arrive at T4S in Madrid, and then I have to connect to T4 for my connection flight to London. Are you sure you are flying to London from the main T4?? My understanding is that all international (i.e. non-Schengen) T4 flights depart from T4S. Ring Iberia and ask whether flights to LHR depart T4 or T4S. Guys, I'm affriad it is not as simple as that. Firstly, T4S (the sattelite part of T4) is split into two parts. With one half of it is designed for long haul non-schengen destinations, the other half is designed for short haul destinations inside schengen. Therefore, whether it is T4 or T4S communicates nothing. However, this is just what it is primarily geared up to, there are huge exceptions too! Iberia flights to Heathrow go from T4. [Even though the UK is not part of (this) Schengen area.] - And BA code share on these flights. But BAs own flights to London go from the non-schengen part of T4S! - Which Iberia code shares on. Generally, the only Iberia operated flights from the non-schengen part of T4S are long haul. All other Iberia flights go from T4 or (the schengen part of) T4S. All other oneWorld airlines generally go from the non-schengen part of T4S [Even to destinations inside schengen.]. Remember schengen is only about imigrational controls, not customs. [And Spain's north african enclaves, plus the canary islands are not part of the normal EU VAT area, but are part of Schengen.] Schengen entry/exit checks can be easily done regardless of which terminal you fly to from. Further, remember that it is possible to route people different ways from the same air bridges depending on the status of the flight! Hmmm... yes that's what I thought and then I also made an account in a Spanish Travelers Forum (www.losviajeros.com), that confirmed this. Iberia flights arrive on T4s and for operational/convenience reasons their flights to London depart from T4. In this scenario, they are "forcing" the passengers to go through immigration control on the connection of these 2 parts of the Terminal. It's been heard that Iberia is trying to work around this, but in the meantime, that's how it is. I still will ask the staff when we're leaving the plane, about where to go/ who to follow. Last week, when I expressed surprise that the flights to LHR, a non-Schengen destination, were leaving from T4, the IB checkin agent told me that they had moved the flights to LHR, which had formerly departed T4S, for their "passengers' convenience." If both are in T4S then it wouldn't take you a lot of time to walk from one gate to the other. 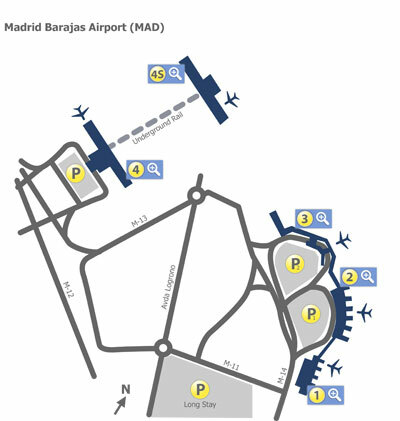 I am flying into Madrid airport in January on Delta, arriving in Terminal 1 at 9:15 AM. I have a flight departing at 11:00 AM from Terminal 3 on Spanair to Barcelona. 1. Do I have enough time to make the connection? 2. What will the process be? Do I have to go through immigration/customs after collecting luggage from Delta? 3. How long does it take to go from Terminal 1 to Terminal 3? I am arriving at MAD on American Airlines from Miami. I am connecting on Iberia Air Nostrum (their commuter partner) to MPL in France. Both airlines are Oneworld, so I'll be checked in at Miami for both flights. The tight connection (95 minutes nominally, but AA is often late with this flight) makes me want to clearly understand the formalities. It all takes place in Terminal 4 and/or 4S which is all I know so far. 1. Is there an arrival security check? 2. Is there arrival immigration? 3. Is there arrival customs? 4. Do I physically transfer my checked baggage after customs, or does it happen without me? 5. Do I check in with Iberia at the gate, or . . .? Many, many thanks for your help with this. The onward flight is a once-a-day one, and I fear I have bought in to a missed connection. I want to hit the ground running. Oh, last questions. Can I expect to see AA staff at the airport, or just IB? If I miss my connection, who do I see? Where would I recover my bag? !